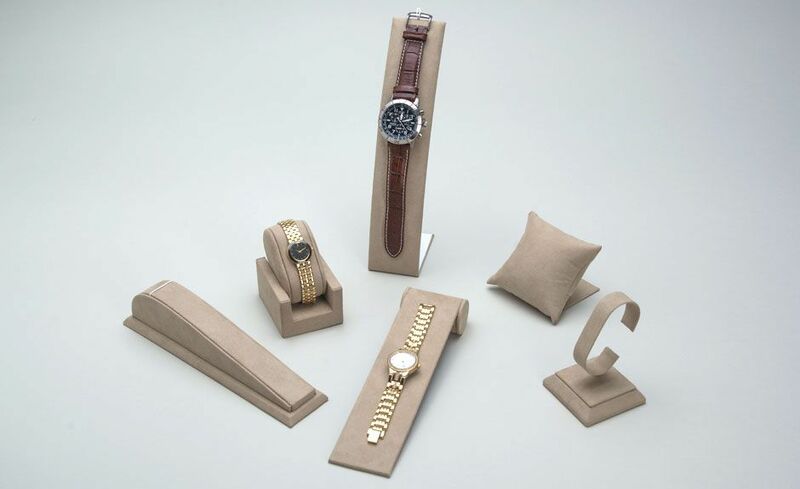 For displaying or storing your watch at home, store, or show, we have what you are looking for. Our endless combination of styles and colors will allow for your timepiece to be presented artfully and elegantly. We carry trays, pads, cuffs, collars, and other displays to suit your every watch display need. Watch presented on a cuff resting on top of a stand. Stand height can vary to suit your need and watch can be presented horizontally or vertically. Our standard size watch pillow is 2 x2 and can be made in a variety of fabrics. C-Shaped metal displayed atop a base, horizontally or vertically, for a neatly designed display Collars are added to a stand. Tray made to fit Watch Cuffs. Custom made to fit your desired amount of watches. Available slanted or flat for presentation or storage purposes. Pads made with elastic to hold watches. Elastic can be black or white and made to fit your desired quantity of watches. Half-cylinder (8” x 5” x 2 ¾” H) wrapped in your choice of material to hold one to several watches/bracelets. Individual bracelet/watch display (1 ½” x 8”). Custom sizes are available. Stylish multi-use display for bracelets or watches. Display fits nicely (2” x 8 ½”) in showroom or home. Useful display holds 6 watches/bracelets in a classic design. Slender design (7 ½” x 8”) makes for a very chic display.